This page details one or more prototype versions of Super Mario Sunshine. This playable demo of Super Mario Sunshine comes from the seventh GameCube kiosk demo disc. The choice of levels is similar to the demo that was playable at E3 2002, and contains six scenarios to choose from. These include the second episode of Bianco Hills in two parts (whole stage, and only the boss battle), the first episode of Ricco Harbor, the second and third episodes of Gelato Beach, and the platforming Secret Stage from Bianco Hills. An identical version of this Super Mario Sunshine demo appears in the Japanese Demo Disc from July 2002. The contents of this Super Mario Sunshine demo are from very late in development, so models and levels are in their final form for the most part. An archive named TitleE3.arc contains all of the assets for the title screen and level select screen from E3. The final version of the logo is included in the demo, so this early version of the US logo goes unused. The most interesting difference is the lack of a Shine Sprite. This is the same level select image that was used at E3. While this is used, it does show an earlier design for the platforming stage: specifically, a stage with a bright sky background, whereas the platforming stages use a starry background. Further, the stage shown here isn't even the one used for the demo. In addition, the Bianco Hills' background uses the unused cloud layer, Ricco Harbor has the unused ship that has a pile of logs, and the Sandbird Tower in Gelato Beach has columns around the walkway which go unused. Included in the archive is an uncompiled, pure XML version of marisun_stage, the level select message script file found in the title archive. The level names are in Japanese, but they're the same levels. The file's creator, Yusuke Shiraiwa, is credited for 2D Programming in the staff credits. Similarly to the final game, a linker address map showing off most of the original source is present on the root. However this time there are two address maps, mario.MAP and marioL.MAP, with marioL.MAP being significantly larger than mario.MAP. The mysterious message.szs archive from the Japanese version is present, but its contents are only present in the Japanese demo. The international demo wiped them from the archive. 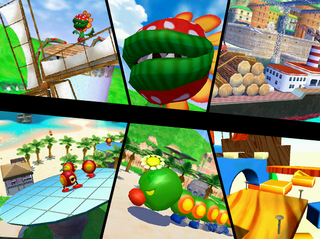 While two Bianco Hills scenes are shown on the level select, they lead to Episode 2 and the Petey fight. As such, the files for Episode 1 go unused. A few small differences that were changed before the game launched. A normal coin sound plays when you spawn a Blue Coin. Mario's victory voice clip when collecting a Shine is a little early, resulting in him interrupting the 'Shine Get!' jingle. The warp pipe sound when entering a stage doesn't exist in the soundbanks of the Japanese demo. When defeating Gooper Blooper in the Japanese demo, a glitch occurs where all sounds cut out. Music is unaffected by this. Two early blue coin sounds still exist in the demo. One is for when you spawn the coin, the other is for when you collect it. This page was last modified on 12 August 2018, at 17:07.